The Art Deco Society of New York presents an illustrated talk about the spectacular, yet often overlooked, Deco architecture of the 1936 Texas Centennial Exposition. Fair Park in Dallas, is one of the finest sustaining examples of Art Deco architecture in the country and is a testament to how World's Fairs often created dazzling spectacles during times of cultural and economic uncertainty. 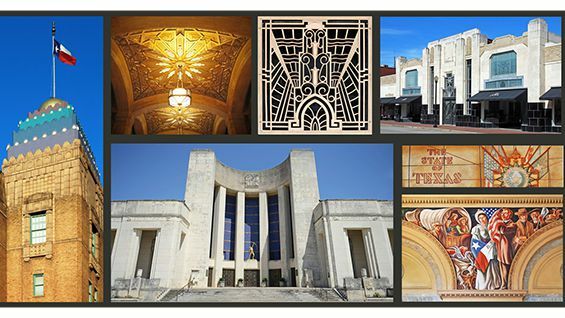 Some of the ornamentation and design within Fair Park also illustrates the World's Fair principle of dynamically displayed regional adaptations of styles, by accommodating historically western motifs and imagery into the Art Deco vernacular. In this presentation, Texas based authors and preservation experts Jim Parsons and David Bush, will present the fairgrounds as they were originally experienced and speak about the work of local and national artists, architects and designers including William Lescaze, Walter Dorwin Teague, Donald Nelson, Pierre Bourdelle and the exposition's chief architect, George Dahl. The speakers will address how the iconic designs - and the inspiration behind them - have kept the "Magic City" a magical destination for nearly 80 years. The event is free to Cooper Union students, alumni, and staff but advanced registration is required. To rsvp please send your name and the name of the event to Events@ArtDeco.org. Paid admission is required for all others. See here to register.